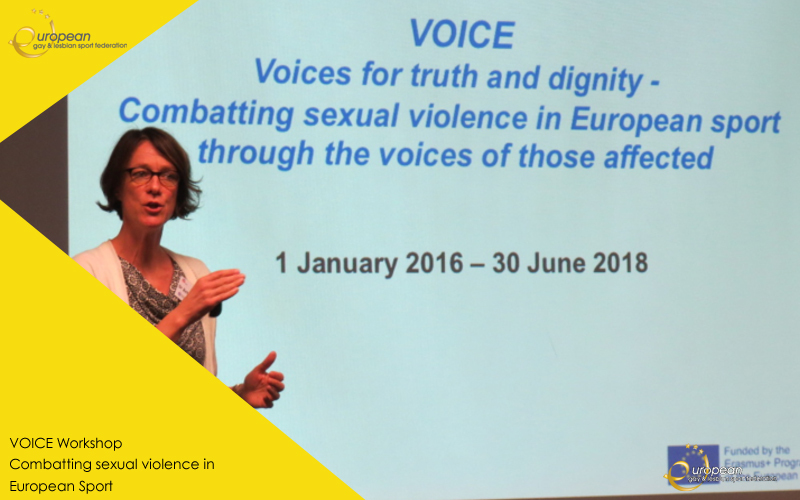 The project Voices for truth and dignity - Combatting sexual violence in European sport through the voices of those affected (VOICE), aims at acknowledgement of sexual violence within sport and putting those affected by sexual harassment and abuse in sport at the centre of the project. Their accounts and experiences help sport organisations to acknowledge the problem and learn about adequate prevention measures. The workshop in Cologne was carried out after the interviews in partner countries have been carried out and most acknowledgment forums have been realised. Participants, representatives of all partner organisations, including EGLSF, listened to the stories of survivors of sexual violence. Through the very emotional and powerful experiences, they worked together in form of several workshops on developing the tools, which will be presented at the final conference, to be organised May 4-5, 2018 in Bergisch Gladbach near Cologne, Germany. The project is co-funded by the Erasmus+ Programme of the European Union. German Sport University Cologne is the project leader, with Edge Hill University, NWG Network and independent professionals as key steering partners. Other stakeholders include dissemination & counselling partners from the European Sport Community, with the Youth section of the European Non-Governmental Sports Organisation (ENGSO Youth), European University Sports Association (EUSA), European Paralympic Committee (EPC) and European Gay & Lesbian Sport Federation (EGLSF). National partners from Austria, Belgium, Denmark, Germany, Slovenia, Spain and United Kingdom take part through respective participating University, Sport organisation and Victim organisation support in each of these countries. Through cooperation with the survivors, research institutions, organisations from the field of sport and victim support / child protection services, project partners are working on developing effective preventive tools and providing recommendations for safer sport. If you would like more information on this project, the latest newsletter can be found here.